Sustainability is the ultimate buzzword in fisheries and it’s led to the ubiquitous red-yellow-green list as one of the most popular means of trying to present consumers with a simple yet comprehensive way of determining whether or not they should order a certain kind of fish. Yet on the wallet cards that attempt to provide an accurate breakdown, there’s one species that’s never talked about: commercial fishermen. There’s no question that the number of jobs available in many fisheries declined in recent years, and the Bureau of Labor Statistics predicts that this will continue. But unlike other industries in which job loss is driven by economic decline or market contraction, in fisheries, productivity is limited by just one thing: fish. Not enough fish means not enough fishing. And anything that causes a decline in jobs is ripe for political pressure to end the slide at any cost, particularly in a down economy. Yet here’s the fundamental problem: There’s not a single politician in the world—not a president or prime minister or poobah—who can regulate, dictate, or legislate more fish into existence. This hasn’t stopped some politicians, though, from pointing fingers in an attempt to score points with their constituents, who understandably blame low catch levels on the regulators who set the limits on how much fish can be harvested. These same regulators are under a legal mandate to set catches at or below levels recommended by scientists based on the best information they can gather. Complicating matters is that at the same time these strict catch-limit policies have taken effect, a new management system touted mainly by environmental groups has gained quite a bit of traction with federal regulators. Catch shares is an overarching term for a management system that, in one form or another, divides up the total amount of fish available for harvest in a given year and allocates it to permit holders annually, usually on the basis of their historical landings. Fishermen can then either fish their allocation, or lease or sell it to their colleagues. Think of it as a cap-and-trade system for fish. A Fish on Fridays column from April has more on the details of catch shares. In certain circles, catch shares have not been fondly received. Some industry members have opposed catch shares in part because they feel initial allocations of fish are too low to allow particularly small, independent operators to remain viable. They fear that economies of scale will result in consolidation of large percentages of fish in few hands, ultimately begetting fewer jobs. While this is certainly a legitimate concern, it’s worth noting that fishery managers can include consolidation caps or other antitrust mechanisms to prevent this occurrence. Opponents of catch shares have found allies in Congress, particularly Rep. Walter Jones (R-NC). Last spring, as the House of Representatives debated a bill to fund the federal government for the remainder of fiscal 2011, Rep. Jones introduced an amendment that was ultimately included in the law. It prevented implementation of any new catch-share system in the Atlantic or Gulf Coast for the remainder of the year. Earlier this month, Rep. Jones and two of his colleagues picked up the anticatch-share banner again. Reps. Jones and Ileana Ros-Lehtinen (R-FL) co-sponsored the ambitiously titled Saving Fishing Jobs Act of 2011, a bill introduced by Rep. Jon Runyan (R-NJ). Among other provisions, the bill would require termination of an existing catch-share program if participation in that fishery declines by more than 15 percent in a given year. Legitimate endeavors to sustain fishing jobs should be lauded. But this legislation misses the broader point. The available number of fishing jobs is tied to the number of fish—not the manner in which those fish are regulated. And it’s not as if alternatives to catch-share systems were doing a fantastic job keeping fishermen employed. 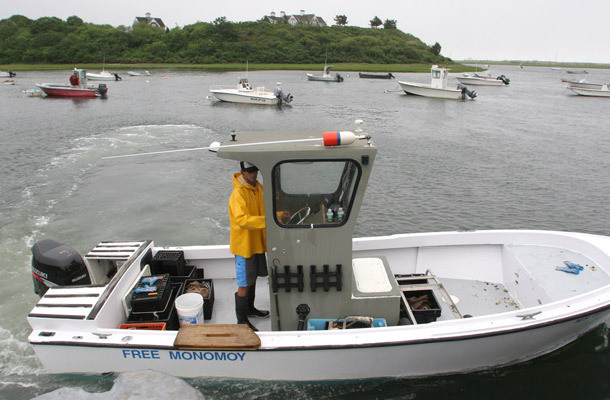 New England’s groundfishery, which includes species of cod, haddock, and flounders, is among the most controversial fisheries to transition to a catch-share system—in this case, a structure known as sector management—which took effect in 2010. While opponents argue that the new system is decimating fishing communities and destroying jobs, history shows little difference between job loss under sectors and under the previous management system. From 1996 through 2007, with the fishery operating in a noncatch-share system, the number of vessels landing groundfish declined by 40 percent. This decline was not reversed in the first year of sectors but it did not get any worse, either. Meanwhile, stocks are showing signs of recovery, and catch limits have gone up in 2011. The conversation is turning from how to end overfishing to how to increase fishermen’s ability to catch the amount of fish scientists and regulators allow them to catch. And there is progress in this regard. The National Marine Fisheries Service has reported that landings in 2010 were basically equal to the prior year, and the value of that catch actually increased. Further, according to New Bedford, Massachusetts fisherman Richie Canastra, once a vocal opponent of sectors, landings in his city are up 12 percent in 2011 over the same time period last year. This is not to say that catch shares are a panacea for fishery management. They won’t work in all circumstances, and they require a tremendous amount of advance preparation and careful regulation. But such a tool should not be demonized or singled out as the root cause of fishing’s economic woes. The point is that rejection of sector management will not in and of itself bring an end to the endangerment of commercial fishing jobs. If Congress wants to support the industry, it must fund more fisheries science that can provide managers access to better data about the true state of fish populations. Perhaps the main reason many of our fisheries are overfished today is that in the past, regulators either ignored scientific advice entirely or chose scientists’ most optimistic estimates and hoped for the best. Effectively, managers opted to gamble with the future of our nation’s fisheries. They made big bets at long odds that if they let fishermen catch more today, fish populations would miraculously rebound tomorrow. Not surprisingly, the vast majority of those bets have failed to pan out. Fishermen already gamble every time they leave the dock. Will they find enough fish to pay for the trip? Will the price when they return be better or worse than it was when they left? Will that storm cell on the fringes of the radar screen blow up into the next Hurricane Irene? They are literally putting not just their livelihoods but their lives on the line. If we can give them even the smallest amount of additional certainty about one of these countless variables, it’s our responsibility to do so. The law is currently structured in a manner that prevents regulators from approving catch limits that exceed scientists’ recommendations. And scientists must account for uncertainty in their stock assessments when making those recommendations. The less certainty, the more conservative the catch limit has to be. This has led to difficult choices and unpopular decisions in the short term, particularly at a time when the country as a whole is facing such dire unemployment figures. But it has also led to safer bets. Back in the fifties, my wife’s Great Aunt Helen used to play the ponies, and she lost a lot more than she won. Finally, Great Uncle Joey got fed up and told his wife, “If you’re going to gamble, make it an educated gamble. Be smart. Pick something where you actually have a chance of winning.” He handed her copy of The Wall Street Journal. Great Aunt Helen became a millionaire. If Reps. Jones, Ros-Lehtinen, Runyan, and their colleagues really want to help their constituents in the fishing industry—instead of helping them chase losing bets—they should buy fisheries managers a better playbook. Michael Conathan is the Director of Ocean Policy at American Progress.